There are a couple sounds I haven’t heard since I’ve moved to Alaska. I haven’t heard sirens. I haven’t heard the steady rumbling of the 60 freeway. I haven’t even heard an ice cream truck or the afternoon call of the elotero man. 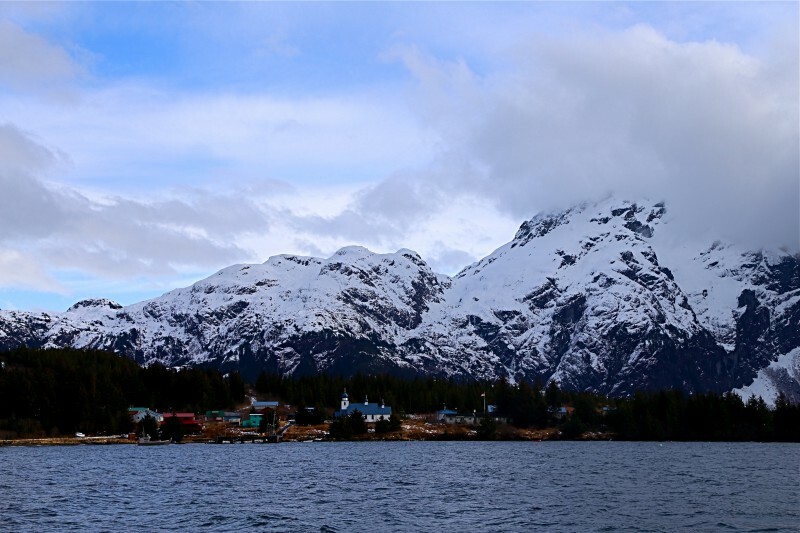 Alaska, instead, becomes a stage for the symphony of wildlife voices. Tatitlek is one of those stages. Tatitlek is a Native village with a population of 88 according to the last census. It rests, nestled just underneath Copper Mountain. Danielle and I were headed there to conduct community owl surveys and give presentations about the US Forest Service and the ecology of forests and owls. After an hour ride on the boat, expertly manned by Law Enforcement Official Andy Morse, we arrived at the dock. Jed Palmer, the Tatitlek school principal, welcomed us to Tatitlek and took us up the road to the school. When we arrived at the school, the students were at lunch and so Danielle set up the laptop and presentations, while I set up the first activity. After the students came back from lunch and settled into their seats, Danielle, Andy and I introduced ourselves and what we did in our respective work. I spoke about my internship with Environment for the Americas and Andy talked about what it’s like to work in law enforcement for the US Forest Service. Danielle then dove into her presentation about different trees in Prince William Sound and the products and services trees provide to wildlife and also to humans. Midway through the presentation, Danielle paused and told the students they would now do an activity where they were to separate a pile of random products into two groups: made from a tree vs. not made from a tree. Some things were a little easier, such as a wooden pencil, but others were a little trickier, like the bag of marshmallows and tube of mascara. However, the students enjoyed the challenge of speculating what products might’ve come from a tree. After Danielle’s presentation about forest ecology, I went up to the board to talk about owls. When I got to the slide about the owl’s vision, I took out an owl mask showing how the owl’s tubular eyes are shaped, and the students had fun holding it up to their face to look through. As I went through each slide about the owls that inhabit Prince William Sound, Danielle would play a sound clip of the owl calls. The students’ eyes widened with amazement when they heard the Barred Owl’s loud murmuring and the high – pitched too-too-too of the Northern Saw Whet. 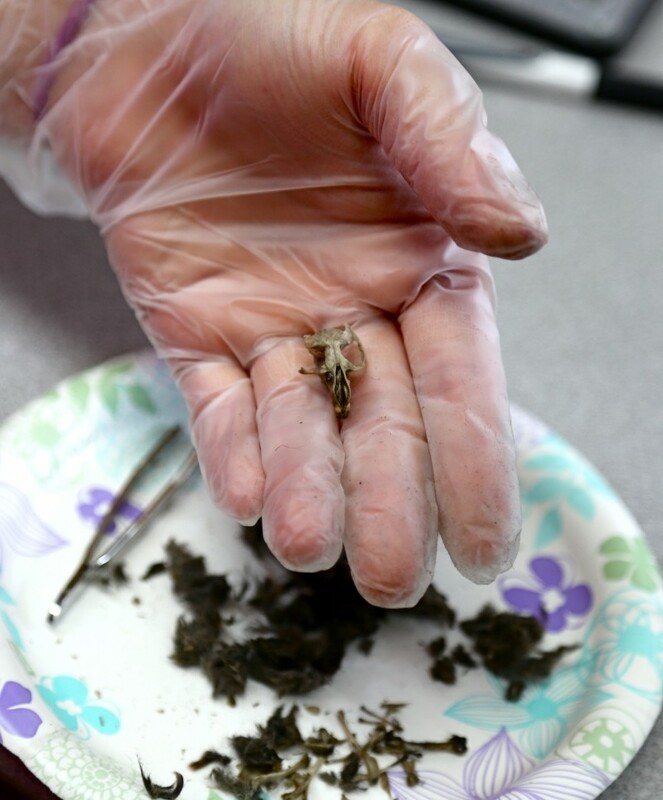 After the presentation, the students dissected owl pellets and made some amazing discoveries about the owls’ diets. As class began to come to an end at 3pm, we announced that Danielle and I were going to be doing an owl survey later that evening and they were more than welcome to join us. Since we had a few hours before the survey began, Danielle and I ventured outside to scout out some good locations to broadcast the owl calls. As we walked, I heard the Varied Thrush whistling in the afternoon breeze. We couldn’t have asked for better weather. The clouds had drifted away and it looked like the night was going to be clear. On our way back to the school, we passed through one of the two main streets and a couple of young kids and a big, friendly German Shepard ran up to us. A few of the kids recognized us from school and asked us how our walk went. We told them we had a good time on the trail looking for places to call for owls and that our owl survey was to begin soon. Jed Palmer and Nichole Palmer, Jed’s wife and one of the teachers at the school, and their daughter, Chelsey, joined us for the owl survey. We drove out on the road, past the Tatitlek airport, until we reached a trail that led into a forest. We didn’t enter the forest, but walked out towards the edge. We stood silent as the broadcast played. 2 minutes of silence, 1 minute of owl calls, 2 minutes of silence, 1 minute of owl calls. This was repeated for 15 minutes. It was getting pretty chilly as the broadcast reached the final track. Sadly, we didn’t hear any calls at this location and it was past Chelsey’s bedtime so the Palmer family headed home. It was true. There was a single, undulating sliver of green across the sky. Not very strong, but a northern light nonetheless, which was still an amazing sight to behold. We stood in the dark, illuminated just by our headlamps, and watched the northern light roll and expand within the cluster of stars. Bolstered by the sighting, we agreed to stay up a couple of hours to head out for a second owl survey. It was nearing midnight when we headed out again. We were near the ferry dock again, playing the broadcast when we heard what could’ve been our first owl call of the night. Unfortunately, the owl was a hesitant owl and allowed us barely a second to hear him before he fell silent. We noted it down anyways, but didn’t record it as a certain identification. Even though, Danielle and I didn’t hear many owls, the students could hear our owl broadcasts from their homes. They knew it was our broadcasts, but they commented later that they now knew what owl voices to listen for in the night. Wow. Was this a blog post on Environment for the Americas or National Geopraphic?! Pretty soon, I’m sure I won’t be able to tell the difference. </:D I love that you saw a Northern light though! Oh and guess what! Kim and I totally went to Grant Rea Park in Montebello this past Saturday. Talk about a world away from L.A.! We both wondered just how it was that you got all the way out to Pasadena every day from such a distance. In other words, yes, we thought of you. And we realized we both look forward to being in touch again soon; in the meantime, say hi to those owls for us, and all the beautiful wildlife in Alaska; also, watch out for the Russians! As well as Sarah Palin! Lol!